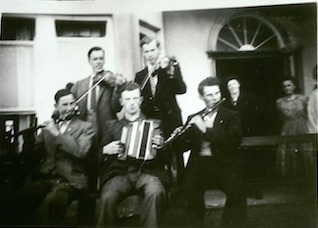 The start of the Abbey Céilí Band: Back row l to r – Bernie Conroy and Paddy Conroy; Front row l to r: Willie Conroy, Jimmy Lyons and John James Lyons. Photo courtesy: Paddy Conroy. The Abbey Céilí Band developed from the tradition of the local Ballygowan Mummers of the mid 1940s. Mummers dances were held in Dolan’s Ballygowan, home of Pakie and Delia the most welcoming and friendly house. The players were John James Lyons playing flute; Paddy Conroy playing fiddle; Willie Conroy played flutes and whistles; Francis Conroy played the Kettle Drum. The Band was invited to play at a house wedding in Gortanumera in 1948. By then we had found a Button Accordeon player named Jimmy Lyons from Killeen. We were invited to play our first ‘gig’ at a marquee in Portumna Fair Green, now the Church grounds. Our pay was £10 out of which we paid Sheehy’s £2 for amplification. The rest went to purchase a new accordion for Jimmy Lyons! By 1948 Paddy Conroy went to work in Dublin. Jimmy Lyons went to England. These players were replaced by Bernie Conroy, a fiddle player, who had returned from the UK. Bernie married Maidie in 1951. Bernie brought structure and a business-like approach to the outfit. He recruited three other Conroy’s, Thomas, Teresa and Johnny from Woodford and also Aggie Heagney. The band went on to achieve success and fame all over the west of Ireland. Back Row: Francis Conroy, Ballygowan, Abbey – Drums. 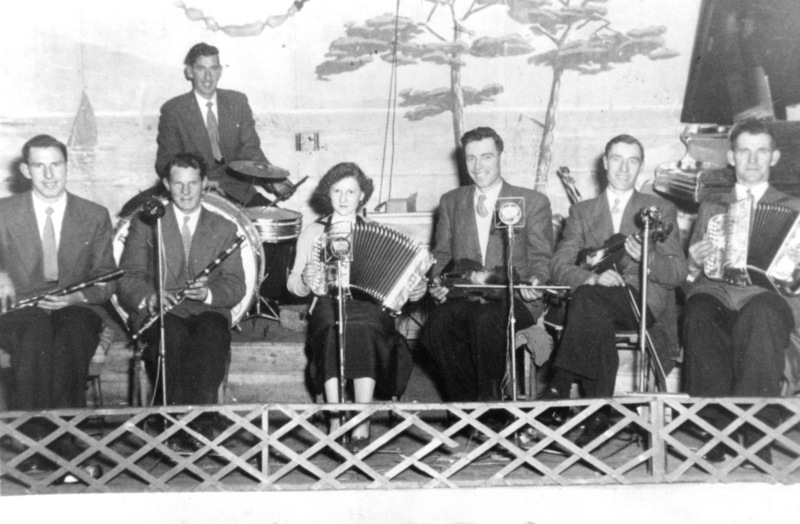 Front Row: Willie Joe Conroy, brother of Francis – Flute; John James Lyons, Coolfin – Flute; Teresa Conroy, Dooras, Woodford – Accordion; Bernie Conroy, Wellpark, Abbey, cousin of Willie Joe and Francis – Fiddle; John Conroy, Dooras, brother of Teresa – Fiddle; Thomas Conroy, Rockhill, Woodford – Accordion.